We all hate acne. It can be embarrassing; affect one’s self confidence and can make one feel psychologically down. Before we go into understanding how to take care of acne, let’s understand what acne is. Acne manifests itself with a combination of symptoms like greasy skin, white heads and black heads, pimples, inflammation and scar formation. Acne mostly affects young people in the age group 14 - 25 years and also sometimes, older women in their menopause years. Keep your face clean. Whether or not you have acne, it is important to wash your face daily to remove impurities, dead skin cells, and excess oil from the skin surface. 2. Get your hormone levels checked. Be extra careful when you notice sudden weight gain, hair fall etc. 3. Watch your diet.Restrict your intake of high fats, oils, sugars, refined and simple carbohydrates. Go for complex carbohydrates, fresh fruits and vegetables instead.Drink plenty of water to detoxify your body. 4. Stick to a gentle shampoo and conditioner.Oily hair can add to the oil on your face, so wash your hair often, especially during a pimple outbreak. 5. Exercise regularly. Regular exercise is good for your mind and your body, including your skin. Working out reduces anxiety and boosts blood flow throughout the body. Over wash your face with strong soap or cleaners This can dry up your skin and take away all the natural oily protection in your skin. 2. Keep your hands on your face. Touching your face, scratching, or pricking your cheek or chin can spread bacteria and irritate the already inflamed facial skin. 3. Go to bed with makeup on. It can clog your pores and lead to breakouts. 4. Go out in the sun often.The sun's ultraviolet rays can increase inflammation and redness. Further, some oral and topical acne medications may increase the skin's sensitivity to sunlight. 5. Worry.Experts believe that one’s emotional state is related to all aspects of health, including skin function. Stress does lead to degeneration and inflammation of your skin. 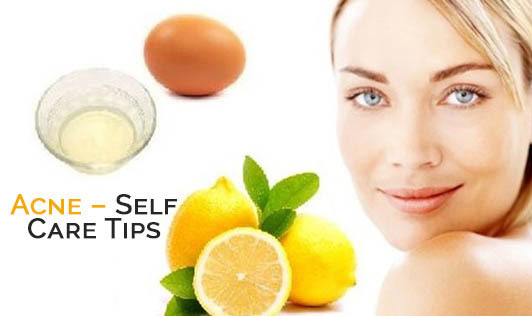 The above self care tips help you manage acne. For severe cases of acne, consult with a dermatologist for systemic medications like antibiotics in addition to topical treatments.